Consider an evening in New York City in late September 2013. Two men and a woman are in the Brooklyn apartment of one of the men, or more likely in her pied-à-terre in Manhattan. Or perhaps nowhere, since I am hypothesizing about this gathering, not recounting. They are reviewing the events of the day, which saw the culmination of a project that the men had begun five years before and of which the woman had learned only a little less than a year earlier. Her subsequent role had been solely as observer and recorder of events, until this morning, when she became a minor participant as well. Perhaps over wine or even champagne, if the mood is sufficiently celebratory, they reminisce about the effort the men expended and the discipline they maintained for those five years. The project itself had been media-focused — text, audio, video — and distributed largely on Twitter and YouTube. The woman fondly recalls a few of her favorite tweets and the amusement or bafflement that some of them generated. There is shared laughter. Or perhaps not, since I am still hypothesizing. Then, without directly acknowledging the elephant in the room — the void that will be present in the men’s lives now that the project is complete — the conversation turns to two questions. One is inevitable and, when amplified by the wine, exciting: What do the men do next? The other question creeps in unbidden and is depressing: Archived files notwithstanding, will anyone remember the project? Will even one person want to tell a future friend or grandchild that they experienced it, read the tweets, saw the videos? Or is it all doomed to a Lincolnian fate, textual and visual memories that “the world will little note nor long remember”? The balance of this post nominally answers the first question: What did they decide to do next? For this, I will add facts to hypotheses, trying always to make the distinction explicit. But whether the story is convincing, even to me, remains open, absent revelations from the three. As for the second question, we will find words, written by the woman in fact, that are as much of an answer to it as we can ever hope for. On June 8th, a micro-storm erupted on Twitter over the appearance in San Francisco of a mysterious book of unknown authorship, entitled Iterating Grace (IG). It was sometimes delivered, with further mystery, on doorsteps of recipients’ homes or to postal boxes with closely-guarded numbers; other copies were sent, and continued to arrive last week (for example, @kvox and @NRaush) and this (@torrez), via regular postal delivery. The recipients are almost entirely media people who cover technology, technologists proper, or tech investors. At least one early copy was received in New York, as well, apparently also hand-delivered. I first learned of all this on June 10th when I received an email newsletter from Robin Sloan, author of Mr. Penumbra’s 24-Hour Bookstore. As he said, this issue was “brief and unorthodox”: he had been suspected by Alexis Madrigal, editor-in-chief of Fusion, among others, of being the author of Iterating Grace, but he offered a cogent and credible denial. This pattern was to play out over the next week with other suspects being targeted and issuing denials, on Twitter and elsewhere online. Just to be clear, the operative word is “play.” No malice in sight. • The Mysterious Case of ‘Iterating Grace,’ Part II on June 9th. • A clue emerges in the curious case of “Iterating Grace”. The artifact itself consists of a 2,001-word story interspersed with hand-drawn recreations of tweets by venture capitalists and startup people like Chris Sacca, Paul Graham, Brad Feld, Sam Altman, and others. The story’s lead character, Koons Crooks, goes on a spiritual quest by contemplating the social media feeds emanating from the startup world. It leads him to a Bolivian volcano and a chillingly hilarious final act with some cans of cat food, a DIY conference badge, and a pack of vicuñas (which are sort of like llamas). Madrigal helpfully scanned IG, which you can find embedded in that first article, or you can download a PDF to peruse at your leisure. There is more to Madrigal and Raile’s articles than the barebones description in those two quoted paragraphs. There is literary analysis of a highly complimentary tone, interwoven with speculation on who might have written IG, or what corporation might have orchestrated it as a publicity stunt. But I’m going to suggest that this is all largely beside the point, that focusing on IG as a satire on the world of startups is misleading, though not necessarily wrong. In fact, the actual intent of the mystery author may have been precisely to induce such an interpretation as a way of making a larger point. So if IG is not intended primarily as the satire that has been suggested and widely endorsed (to the extent that 1-click retweets constitute endorsement), then what is it? When I saw the scans of IG and the embedded, handwritten copies of the original tweets, my first thought was, “Oh, this looks like a take-off on Nick Bantock’s Griffin & Sabine trilogy from the early 1990s.” Those books told their story in the form of correspondence between the two titular characters, presented as the printed obverse and reverse of handwritten postcards and glued-in envelopes from which you, the reader, could remove, unfold, and read letters. Very novel, very tactile, very voyeuristic, very successful financially. But I also realized (while I was still reading Madrigal’s first article) that it was a very inapt comparison. G&S was a mysterious story, but that’s where the similarity ends. You could walk into your local bookstore and buy it. No one mailed it to you unbidden or left a copy on your porch unannounced. In other words, there was no additional set of events, no experience, in which G&S was largely a prop. That’s when the dominoes started falling: If IG is similarly a prop — albeit one with a few embedded clues that I will cherry-pick below — then it’s the overall experience that should be examined closely. What is unusual about it? Who could have undertaken it? With what motive? Profit? Publicity? Pranksterism? …this took an incredible amount of work and planning. Someone hand drew tweets. Someone got X number of copies of this thing typeset and printed and distributed. Someone found my home address and walked up to the door and slid two copies (one for me and one for my wife, the writer Sarah Rich) through the mail slot. Why do all this, if not for money? Who has the time? Perhaps someone who wanted to make a more subtle point — that much of the technology community fails to distinguish clearly between how a user experiences a product (the UI) and the value of the product to the user. Hence, to paraphrase Andrew Parker, writing in The Gong Show blog, the failure of much current technology design can be traced to the absence of this distinction. The parallel here? Stop looking at the product, the captivating little book, and look instead at the experiential interface, the events. The unannounced visits to homes, the “creepy” (Madrigal’s word) knowledge of P.O. Box numbers, the annotated envelopes and unique contents (such as the thank-you note to Madrigal, below), the identity of the print shop, etc., are the interface. Figure that out and only then look at the value, the meaning, of the print content and storyline. I said it was subtle. So back to Madrigal’s first exasperated question: Why do all this, if not for money? The “subtlety” answer above is plausible, I suppose, but I am too unfamiliar with Bay Area tech culture to know how on-target it might be. Instead, I suspect the answer is more universal, and I hinted at it above with “play” and “pranksterism.” Why not just concede that noses, and egos, are being playfully tweaked with the total IG experience by someone who sees too much self-seriousness in that culture, especially perhaps among the tech-focused media types? Then what about Madrigal’s second frustrated query: Who has the time? Who indeed? I will now tell you who gets my vote. In fact, in one obscure but public venue, I’ve already voted. My “Ah, ha!” moment about IG went directly from an observation — mysterious books were delivered anonymously, for no obvious reason, to a cohesive group of people (Bay Area technorati) — to a hypothesis — this activity was undertaken by the same people who several years earlier delivered mysterious messages anonymously, for no obvious reason, to a cohesive group of people (their Twitter followers). Such guesses or hunches are a form of logic known as abductive reasoning, often referred to as inference to the best explanation, and they generally start from an unfamiliar or surprising circumstance. Many of us have unknowingly experienced it as part of medical diagnosis, especially if a succession of refinements and new diagnoses were required. (l-r) Thomas Bender, Jacob Bakkila, Susan Orlean at the Horse_ebooks & Pronunciation Books “reveal,” Sept. 24, 2013. Photo from @moneyries. In order to see how good this “best explanation” might actually be, I’m going to distinguish two lines of inquiry. Could they have done this, that is, did they have the experience, skills, and opportunity to carry off the IG performance? And would they have done it, that is, did they have the interest, motivation, and predisposition to do it? Think of it as pragmatic vs. philosophical parsing. First, for those not familiar with the players, here is the leanest possible back story, with apologies to Susan Orlean and her wonderful telling of Man and Machine: Playing games on the Internet: In 2008, Bakkila and Bender first gained a widespread online following with a faux tourist promotion video entitled This Is My Milwaukee. Then between 2008 and 2013, they were the human masterminds behind the Twitter account @horse_ebooks, generally believed to be a spambot, and the YouTube channel Pronunciation Book, respectively. It all came to an abrupt end on September 24, 2013, with final postings to both accounts and simultaneous release of a video-based alternate-reality game called Bear Stearns Bravo. Currently: I am working on an untitled book project. Interesting and consistent, but hardly confirming. Lots of people have untitled book projects. In addition to the specific finger-pointing in articles and tweets over the past two weeks, some generic criteria have been suggested for the creators of IG. Most of them fall in the it-must-be-one-of-us category, more often than not narrowed down to the tech-media community in the Bay Area. According to Orlean’s article, in 2013 Bakkila was a creative director at BuzzFeed and Bender was a tech consultant (although several sites easily-found on Google place him at Howcast then and apparently now), both in New York of course. 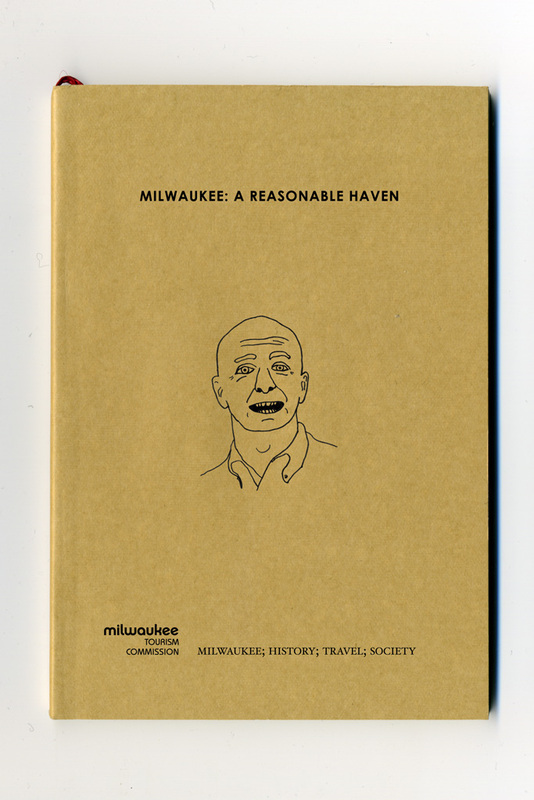 Clearly they have the necessary tech skills and broad insider knowledge to conceive IG, including a (seemingly genuine) bound volume as part of ‘This Is My Milwaukee’ (see above). They also have unquestionably shown the requisite commitment and patience. Frankly, IG strikes me as far less substantial and demanding than Bear Stearns Bravo by itself, let alone with Horse_ebooks and Pronunciation Book added in. So for me they pass that test. That still leaves the presumption of co-location in the Bay Area and an intimate grasp of the history of startups in the area. As I said above, if the experience of IG is more important than the content, then that is an assumption I am willing to relax. They could always find local collaborators, and gathering history online just requires time, something they have shown a willingness to invest. …I’m fairly certain this is a Wired expat, from the design side of the magazine. So you might want to look there – people who have left sometime in the past 18 months or so (hence time on their hands for elaborate things like this), who had been with the magazine for a fairly long time before that. This made me sit up, because I already knew from Bakkila’s page on LinkedIn that he had left BuzzFeed in October 2014 and not started at his current position at Droga5 until January 2015. That would create somewhere between two and four months of “time on his hands,” per Popova’s suggestion. I immediately sent a tweet to @brainpicker, asking “How about friendly amendment: BuzzFeed (instead of Wired) expat as creator?” Alas, but not surprisingly, I’ve had no reply from her to date. There was another connection to BuzzFeed in Madrigal’s first article, which listed people who had received copies of IG at that point. Two of them are at BuzzFeed, and one of them, Mat Honan, was suspected early on and then dismissed as a possible author of the mystery book. In any case, Honan is West Coast, Bakkila is East Coast, and their times at BuzzFeed didn’t overlap at all. Not that that should stop a hypothetical collaboration. After all, someone who knew people and addresses could be a delivery person and do other mysterious things, yet still honestly deny authorship. I’m just sayin’, hypothetically. Fun though that last paragraph is to imagine, there really isn’t much on the pragmatic side to support my argument (or to deny it for that matter), beyond Bakkila and Bender’s tech media credentials and organizational abilities. Other than a full confession or revelations from a collaborator, the only truly compelling evidence would be something like a receipt from a printer for 140 copies of a small bound volume, or a record of airline flights into SFO to satisfy a skeptic who insists on physical rather than virtual presence for those doorstep deliveries. In answering this philosophical question, it doesn’t really matter what Horse_ebooks and Pronunciation Book were “about” but rather that the entire five-year enterprise was arguably the greatest piece of “performance mischief” (Bakkila’s term) in the 21st century, what one admirer described to Susan Orlean as “art to the most modern degree…. It was such a long con.” She didn’t say verbatim, but easily could have, that their performance was about viewing decentralized, personal technology through the lens of Dadaism, or iDada, to use the current all-purpose elision. To me, the best and juiciest part of this high art is the way it has taken the networks of tech journalists and the thinkers we often cover as its canvas, triggering an autonomous response by media types through the insertion of a twee and harmless little novella delivered unsettlingly to their personal addresses. It’s the combination of disturbing invasiveness and inscrutability with the coy satire and playful appeal of the book that gives whatever art this is a power of its own. Maybe I’ve gone too far down this rabbit hole, but I think I hear a faint echo of the subtlety argument taken from Andrew Parker’s experience-vs.-value dichotomy (above), but now emphasizing the user’s sense of negativity that arises from failing to distinguish fully the interface (“disturbing invasiveness”) from the product (“a twee and harmless little novella”). Bakkila decided to take over an existing bot on Twitter, and then slowly subvert its tweets. He wanted to attempt an identity inversion: he would be a human trying to impersonate a machine that was trying to impersonate a human. …net art often makes use of ambiguous identity and deliberate misdirection. By definition, it examines the nature of our relationship to machines, and the notion that machines or computer systems might be closer to sentience than we realize. Bakkila could not have helped but know that concerns over technology security and personal identity are widely-held in the tech and VC communities. Witness Paul Madsen proclaiming, “I am not a bot! I am a human being! I am a man!” in the Ping Identity blog last December (2014). Overall, I take the answer to the philosophical question to be a solid “yes” for Bakkila and, by implication, for Bender. They clearly have a penchant for projects like IG and therefore the inference is that they might have done IG. • We may never know who wrote that mysterious satire about Silicon Valley. Three things stood out as I read it. Firstly, he was throwing in the towel, as the title implies. Secondly, he included some of the text of the last two emails that he received from “the author(s),” whom he pointed out wrote in first person plural, consistent with my hypothesis, but also with an “imperial we” usage or of course simple misdirection. We understand your curiosity about our identity but feel it’s not the point. Please, don’t worry about it. The point was just the book – the joy that went into it and whatever came out of it. And now, enough has come out of it. Surely we’ve taken up enough of everyone’s time. In the end, time is all we’ve got. We all lie down for the llamas eventually. If this is not the same person expressing the same philosophy applied to two different performance projects, then Jacob Bakkila should be the one doing the sleuthing… to find his new soulmate in art and mischief… the one who sounds as much like Bakkila as, well, Bakkila does. The pressed flower, an anemone, delivered to Alexis Madrigal with his copy of the book. None of the foregoing addresses the most intriguing or improbable or even outrageous possibility offered here, namely, that Susan Orlean, a very respected book author and writer for The New Yorker, may have knowingly participated in this bit of mischief — as the principal author of the book. Let’s try this: “He is tall, with bristly blond hair, a square jaw, a sturdy neck, and biceps that look gym-made.” That’s Koons Crooks, as described in that first long quote from Iterating Grace, near the beginning of Madrigal’s first article, right? Wrong. It is Susan Orlean describing Jacob Bakkila in her New Yorker profile. Well, lots of people are tall, with a square jaw and muscles. And the hair is a complete mismatch. True. But please remember that Koons Crooks is totally made up, so I hypothesize that the send-up could include a few repurposed hints, intentional or unintentional, but not so many that anyone would immediately recognize the similarities. I spend a lot of time on Twitter, and I came across Horse_ebooks by chance, in 2012…. That October, I received an e-mail from someone whose name I didn’t recognize, asking if I wanted to know more about the account and, perhaps, write about it. Potential subjects don’t usually promote themselves to me in such a way, but I was interested in how that corner of the Internet works. Everything else that she wrote followed from that. There is, however, one unasked, unanswered question: Why did Bakkila and Bender choose her to approach? Great writer: check. Known for delving into unusual subjects: check. New York-savvy: check. Twitter devotee: maybe not so obvious. The account @horse_ebooks had roughly 200,000 followers, so the chance of their stumbling on her would have been slim, though not impossible. On the other hand, if they had an independent interest in her, then they could easily have checked her Twitter account, maybe even finding their tweets among some of her favorites. Staying in the hypothetical mode that I entered in that last sentence (in case you didn’t notice), what else might have caught their attention about Susan Orlean? I can project one thing retrospectively, the other prospectively (relative to the October 2012 first contact that she mentions). They could hardly advertise their interest in performance mischief, so they talked about “performance art” instead. They avoided art critics, academics, and especially practicing artists. Maybe it happened in conversation at a party, or searching online, or looking through a stack of very old magazines at a relative’s house. However it happened, they found a New Yorker article by Susan Orlean from December 31, 1990, written about two years before she became a permanent staffer (and when they would have been in first grade). It is the oldest item in the Articles section of her eponymous website, and its title is My Life: A Series of Performance Art Pieces. Bakkila and Bender must have been giddy, as if Hermes or Coyote had materialized before them with the email address of a kindred spirit. Hearing this, or something like it, Susan Orlean (in her Manhattan apartment hypothetically) gets up and walks across the room to a bookshelf. She selects an obscure book called Flowers in Shadow for which she wrote the Foreword in 2002. It contains photographs by Zeva Oelbaum of pages of pressed flowers from an anonymous 1896 journal discovered in a trunk in Maine. In the first two paragraphs, Orlean describes finding a four-leaf clover pressed between the pages of a dictionary that she inherited from her grandmother a few years previously. The serendipitous discovery prompted a long list of unanswerable questions but also “a sense of her as I’d never actually known her, as a young woman with the time and patience to sort through blades of grass….” The third paragraph mentions the photographs themselves. There is also a fourth. So this is what’s left behind, these things that end up as our real inheritance—the flotsam and jetsam of life, the stuff that drifts into our hands and into history, the chance impression, the little shadow each of us casts, the fragile thing someone carefully catalogues and cares for and then forgets or maybe doesn’t, the image of an image that conjures a memory that is either real or imagined—these are here, plucked and pressed between the pages, so they will stay fresh forever, or forever slip away. It dawns on them, as it had obviously done on Susan Orlean listening to Jacob Bakkila, that this view of memory and fragility applies as much to emails and tweets as to pressed flowers. And in that hypothetical, prospective moment, the anonymous journal of pressed flowers and her lyrical words about them become the seed and the manifesto for Iterating Grace. Anemone coronaria aka ‘Harmony Orchid’. Photo of anemone from River Bend Nursery. If the foregoing was an unpublished manuscript in, say, the ‘High-Energy Physics – Theory’ section of the e-print archive, arXiv.org, I would be done writing and you would be done reading. I would sit back and wait for observational or experimental results from the Hubble Space Telescope (HST, left panel in the triptych above) or the Large Hadron Collider (LHC, right panel), respectively. If some kind of confirmation eventually emerged, I might keep going, or others would pick up the topic. But if the results were incompatible, then the theory would be disproven, I would move on, and the manuscript or its published version would be like a forgotten flower pressed between pages in a digital library. That’s the way science works. Results may be found that confirm or disprove an idea, but it is never proven. Only mathematicians and computer scientists get to deal in proof, no matter what you may read in the popular-science or mainstream press. It turns out, however, that there is a “literary HST-LHC” just waiting to test the theory that Susan Orlean might have been the author of the narrative portion of Iterating Grace. I first ran across mention of the technique in that email newsletter from Robin Sloan: “I explored the use of stylometric analysis (because of course I did)….” I hadn’t heard that term before, but the etymology made it clear that it was something about “measuring writing.” Presumably a steroidal version of the on-again, off-again search for the identity of the “real” author of this or that Shakespeare play or other masterpiece. I have to admit that I am entirely skeptical of Susan Orlean’s authorship — less so, when you frame it in terms of [Bakkila & Bender] — and yet she appears to be the most likely candidate of any who have been named so far. Attached are two graphs that each account for text similarity in different ways, but that both put IG well within the space circumscribed by a few of her most recent New Yorker pieces. Note also that I ran The Orchid Thief through the algorithm as well, separately from her NY articles (you’ll see it in the graphs). In addition to the graphs, I also have a more sophisticated classifier algorithm that indicates IG is most like the Orchid Thief — even more so than SO’s articles. Teddy’s steroidal-Shakespeare-identification method uses lists of the most frequent words (MFW) that appear in the novels and stories written by the authors named in the legend. MFW are usually connective words like “the,” “which,” “and,” etc. This choice is based on the observation (and its presumed general applicability) that, regardless of what topic authors write about, each will usually write sentences in the same characteristic way. Thus, to considerably oversimplify, the MFW are a sort of verbal fingerprint of the author. The graphs above look at each text’s list of most frequent words using two different techniques, Principal Component Analysis (PCA) and Cosine Similarity (COS), scaled into two-dimensions. His “more sophisticated classifier algorithm,” mentioned in the email, is a Support Vector Machine that searches for a multi-dimensional plane (a hyperplane) that maximally separates the volume of each author’s datapoints from the others, and then checks to see which volume, if any, contains the target text to be identified. You can read the Wikipedia links to learn more. [Note added on July 5th: Or you can read Teddy Roland’s more detailed subsequent explanation, Attributing Authorship to “Iterating Grace,” or The Smell Test of Style. This includes some updates and clearer graphs, though no fundamental change in conclusions.] It’s enough here to look for overlaps of authorial Xs with the big dot for Iterating Grace. (Please note that the Xs for Susan Orlean are a pale green. In order to see them clearly, you may have to substantially increase the brightness of your display.) Remember, as always, that correlation does not equal causation. Also, these results are internally comparative. That means that the numerical ranges on the axes are not absolute, but will vary depending on what datasets (possible authors) are included. Hence, these more inclusive results need not match up, either absolutely or relatively, with those in Teddy’s two tweeted graphs (above). I want to emphasize that the effectiveness of this classifier is limited by the samples that are included in it. I am confident in saying that IG is more like SO than any other author under consideration, but of course, it is possible that the true author was not in the list. The PCA graph makes a relatively strong case that SO is responsible since IG lies close to the middle of her cluster (i.e., that it shares important features); but the fact that IG is on the edge of the COS graph suggests that, overall, it may simply be less dissimilar to her work than to other authors. I should also point out that these methods are very sensitive to genre — even for the same author writing say fiction and non-fiction. The strong similarity to SO might be an artifact of her writing narrative non-fiction. Action is reported after-the-fact rather than ongoing; the story is centered on a single protagonist who doesn’t interact with other characters; the narrator reflects periodically, trying to understand the motivations of the protagonist. There is one other thing to consider which is that empirically, authorial style is most well-defined under these kinds of methods once you have a sample of size 5000 words. The story itself is only 2000 words, so authorial style hasn’t fully congealed yet; we only have a fuzzy sense of it — which is part of why I throw 100 x’s (i.e. random 2000 word slices) on the graph for each book. These findings are entirely mediated by the possibility that IG might not be fully representative of its author’s style! Pardon all of these qualifications. I simply wanted to open the black box of the algorithm for you so that you could see its inner workings. I remain skeptical of SO’s authorship, but you have opened a lot of interesting doors that I plan to look through. These paragraphs are a good antidote for anyone who wants to over-interpret the graphs or puts too much weight on any of my qualitative arguments. Everything presented here is inferential or circumstantial, at best indicating compatibility. There is no surveillance camera record, as far as I know, that shows Jacob Bakkila or Mat Honan or anyone else sneaking up to Alexis Madrigal’s doorstep and depositing a large manila envelope. Nor an overheard conversation at Blue Bottle Coffee in Brooklyn of the pranksters organizing the performance. Please combine Teddy’s qualifications with the others that I sprinkled above — there’s no proof in science, correlation does not equal causation, your investment results may vary, and so on. Besides, the real artists and authors might decide to come forward, which would make all this moot. (It’s already trivial, but it would sink to total irrelevance in that event.) Until then, enjoy it, and make of it what you will. Note and Acknowledgment: Teddy Roland originally self-described as “entirely skeptical.” He eventually added, “I want to believe,” though I don’t think that makes him any the less skeptical. I would self-describe as “hopefully skeptical,” so I think he and I are in similar places. Despite the conviction that you might think is behind my words, it is more a reflection of enthusiasm for the hunt, not certainty of any conclusions. Either way, it has been great fun and a pleasant surprise to discover our Oberlin connection, even if separated by a bit more than four decades. Thanks, Teddy. This entry was posted in Art | Design, Science, Technology, Words. Bookmark the permalink.